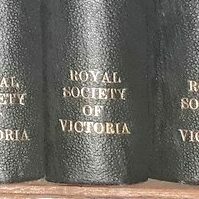 This article follows a panel presentation to the Royal Society of Victoria on 28th February, 2019 from Dr Leah Heiss (RMIT), Dr Nolene Byrne (Deakin), Dr Rajesh Ramanathan (RMIT) and Dr Lyndon Arnold (CSIRO/RMIT). How can textiles quietly heal us? Are wearable medical devices of any use when patients are too stigmatised to wear them? What good is fancy cycling gear that won’t protect the rider? Can we close the loop on global fashion, the world’s second biggest polluting industry? 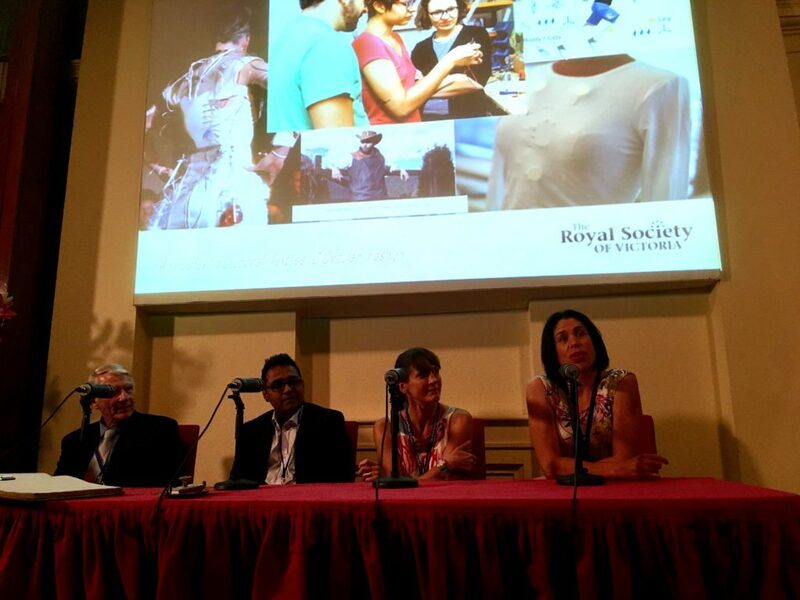 Below are highlights from our fantastic “Fashionable Science” panel discussion on 28 February from Dr Leah Heiss, Dr Rajesh Ramanathan & Dr Lyndon Arnold from RMIT University and Dr Nolene Byrne from Deakin University. 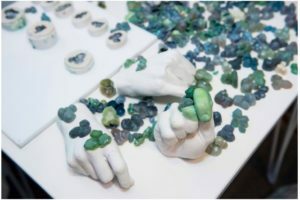 Leah’s designs are based on natural forms, such as minerals. This was her display at Humans 2.0 during National Science Week in 2018. Dr Leah Heiss has ‘a strong commitment to making wearable technologies look better’, so that the medical devices and technologies of the future will neither be ‘ugly nor beige’. When developing biomedical devices, bioengineers, researchers and medicos often neglect to think about the aesthetics and occasionally practicality in favour of function. But beauty in healthcare (e.g. fashionable wearables and well-designed hospitals) can make it more desirable, and more likely that patients will adhere to treatments. Leah’s work is highly interdisciplinary, working with experts from nanotechnology, engineering and health services through to manufacturing. The Diabetes Jewellery project was developed in collaboration with Nanotechnology Victoria in 2007. The technology allows for pain-free delivery of insulin to the body using nanoneedles that inject insulin through the skin, therefore replacing syringes. Originally attached to a large apparatus, these nanoneedles have been compacted into contemporary jewellery, including rings and necklaces. Leah also brought engineers and weavers together to produce the Smart Heart necklace, a wearable cardiac monitor with the capacity to collect, store and remotely transmit cardiac data to medical professionals for analysis. 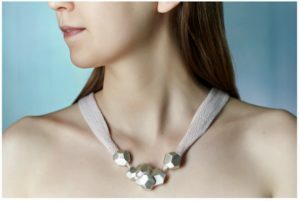 The neckpiece aims to replace bulky cardiac monitors with something that is more easily worn. Leah received the 2018 Good Design Award and CSIRO Design Innovation Award for her Facett hearing aid. 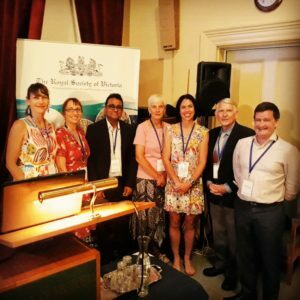 She spent time with hearing aid users learn about their experiences, and realised that an ongoing frustration, especially for those with arthritis or vision impairment, is replacing tiny batteries in hearing aids. Facett uses a magnetic connector to recharge, bypassing the need to handle finicky batteries, and its sleek design aims to shift stigma of hearing aids being used for a ‘disability to desirability’. How convenient would it be to clean clothes without the hassle of washing them? 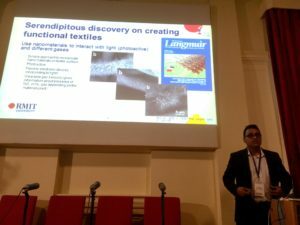 Dr Rajesh Ramanathan has the solution by incorporating nanotechnology into textiles. Nanoparticles can impart interesting properties and functionalities into materials. One property that Rajesh uses to his advantage is photoactivity, where light is a trigger for a reaction. To design any wearable material with this technology, he had to overcome the challenge of making it retaining its properties with repeated washes – a feat that took 3-4 years. His original intent was to translate this technology into wound management, to both encourage the healing process and prevent infection. Rajesh developed a nanomaterial that provides electric stimulation when exposed to infrared light. 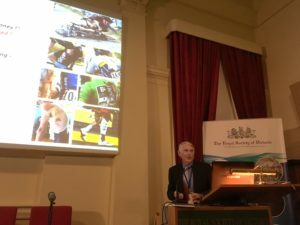 Electric stimulation has been long known to accelerate wound healing, and was even used by the ancient Greeks and Romans in the form of ‘electric eels’ in footbaths to treat pain and increase blood circulation. Additionally, Rajesh’s nanomaterial fabric contains silver, which has antibacterial activity, therefore killing any bacteria that may enter the wound. Two serendipitous by-products of his invention were wearable sensors and self-cleaning materials. By incorporating semi-conductors onto fabric, it could store and transmit information, thereby able to measure and sense various parameters (e.g. that can measure oxygen levels in a room). Lined with copper and silver, the nanomaterial could break down molecules in an organic stain (i.e. from food) when activated by light. Imagine not having any hassle of cleaning after accidentally spilling wine down your front! Originally designed for one purpose, Rajesh has killed three birds with one stone in unexpected discoveries along the way. Circular fashion is the next big thing. The global textile industry is the second largest polluter of clean water and nearly five per cent of all landfill space is consumed by textile waste. Cotton consumes the highest amount of harmful pesticides and copious quantities of water, and similarly, textile-manufacturing units release hazardous waste into nearby land. Dr Nolene Byrne has developed a way to recycle textile waste into useable products. She collects cotton-based textile waste and breaks it down into the fibres it was originally composed of. She mills solid coloured clothing into coloured powders, which can then be used to dye new clothes, eliminating all the energy and water involved in the normal dying process. This takes her ‘back to kindergarten’ as she mixes different coloured clothing waste to create different coloured fibres and dyes. Nolene’s biggest campaign is turning jeans green. As denim is made of cotton, a natural polymer comprised of cellulose, it can be broken down back into cellulose. She and her PhD student, Beini Zeng, dissolve denim and manipulate the remains into an aerogel of cellulose material. Aerogels are a class of advanced materials with very low density and are porous with many nanoscale tunnels, making it an excellent material for water filtration, absorption, and bioscaffolding. The aerogel produced from this process creates a structure almost identical to cartilage, and now she can shape it by manipulating the size and distribution of tunnels to make it an ideal shape for synthetic cartilage to replace damage knee cartilage in arthritic patients. Ultimately, Nolene wants to eliminate waste and environmental pollution in the textile industry by making fashion circular. 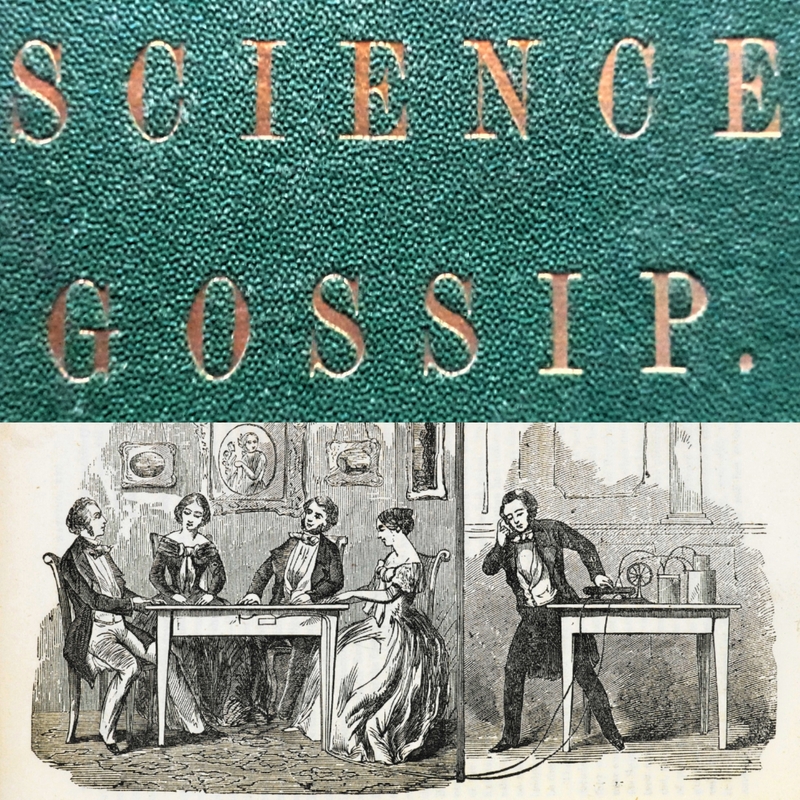 ‘Fashionable science is not just about catwalks’. Lyndon Arnold belongs to a protection racket, designing clothing that keeps people safe. He tests various fabrics and materials for their strength, practicality, and susceptibility to damage so that he can constantly improve the safety of clothing. Firefighters need protection from fire, radiation, and sparks, but most outer materials that provide sufficient protection are UV-degradable (exposure to the sun for a few months reduced their strength to 20%) – not ideal for those who have to fight fires in the Australian summer. Other factors to consider in the design are heat generated while working, visibility through smoke, and heat conductivity of zips. Lyndon had to design firefighter uniforms that could best suit the extreme temperatures and dangers that those wearing them face. He also designed colourful, reflecting safety vests for railway workers to be seen by train drivers. On the other hand, for soldiers, to be seen is to be killed. Lyndon has thoroughly researched the design of ballistic vests, and impenetrable body armour. 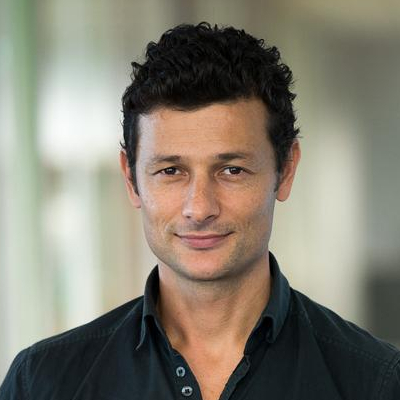 He and his team have developed fabrics that improve resistance to stabs and punctures. They also developed fabric for cycling gear that minimise abrasion upon impact when a cyclist falls to reduce injury. The material also aims to keep wounds as clean as possible if tearing does occur to prevent infection. By testing various materials and incorporating textile engineering, he is able to make protective clothing for the survival of others.